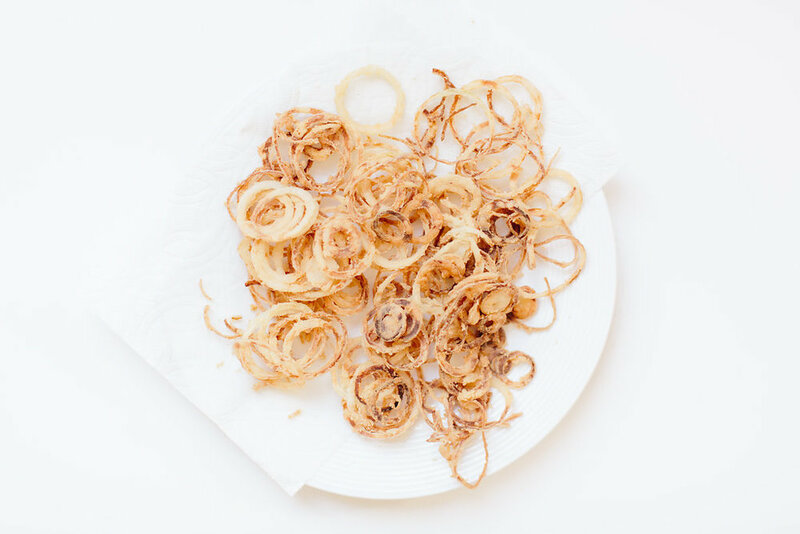 I created this gem of a recipe last November and have been waiting to share it with you: homemade crispy fried onions. Delicious on their own, but even better over green beans. This Thanksgiving, don’t serve mushy green beans, swimming in a pool of canned mushroom soup. 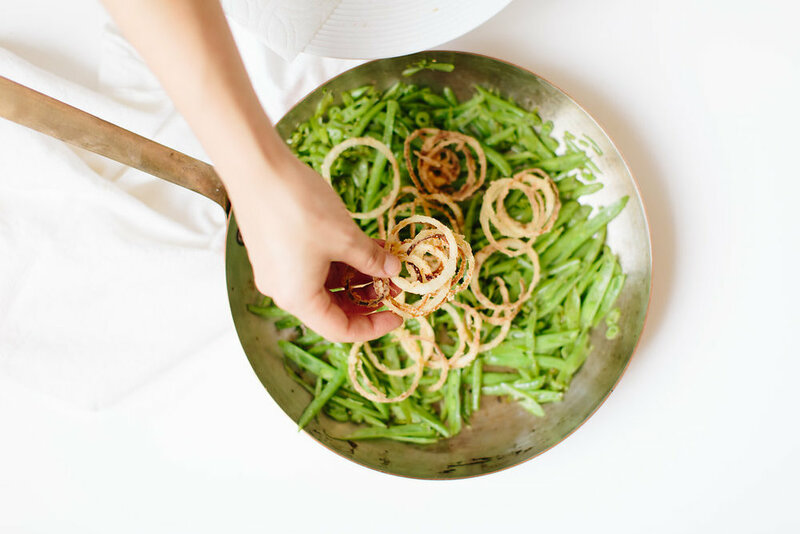 Revamp that traditional green bean casserole with something lighter, tastier, and with a perfect fried-onion crunch! 20% of the produce grown in the US never makes it off the farm, often going to waste, because it doesn’t meet the strict cosmetic standards of grocery stores. Over 6 billion pounds of produce is wasted nationwide every year and food is the second largest contributor to U.S. landfills. Food waste ends up wasting nearly a quarter of our water supply in the form of uneaten food. As a country, we spend over 220 billion dollars growing, transporting, and processing over 60 million tons of food that goes to waste. According to the UN, the food that currently goes to waste could feed the 800 million hungry people in the world twice over. If food waste were a country it would be the third largest producer of greenhouse gases behind China and the United States. Imperfect Produce works directly with farmers to distribute “ugly” produce through a subscription box delivery service. 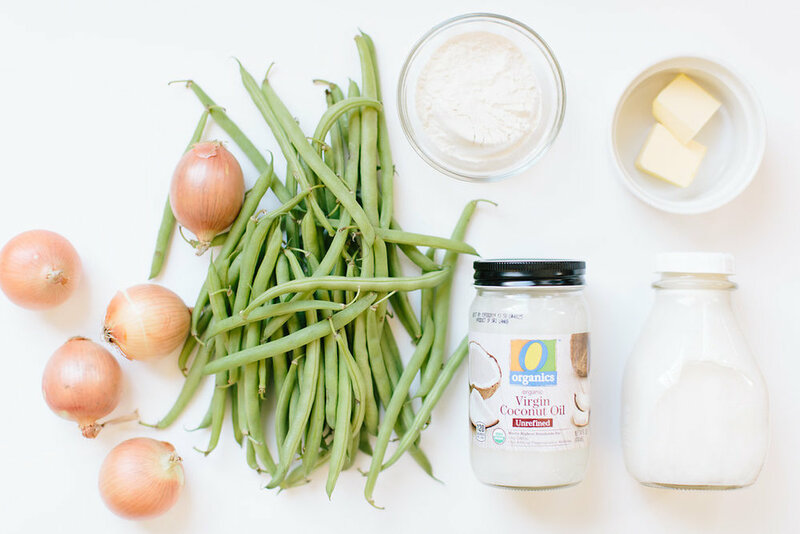 * When my first box arrived with the sweetest green beans, and two almost-perfect baby onions, I knew it was time to share this recipe. If you want to try Imperfect Produce, use code “FOODLALA” for 20% off your first box of “ugly” produce. You’ll eat well, and together, we’ll take one step toward saving this generous planet of ours. *Currently in the Bay Area, LA, Orange County, Portland, Seattle, and (soon!) Chicago. Use a mandolin or a food processor to thinly slice onions, then set aside in a bowl. Pour milk over onions so they’re completely submerged (WHY? #1). Let sit for 20 minutes. Using a fork, pick up the onions and dredge in the flour. Shake off excess flour and repeat with all onion. In a small (WHY? #2) saucepot warm the coconut oil. Use a pot that’s small enough for you to have at least 2” of coconut oil. The oil should sizzle when you flick water on it, but not smoke. Using a fork, drop some of the onions into the oil. Do not overcrowd the pot with onions (WHY? #3). The onions should start to sizzle (if they don’t, turn up the heat a bit). Let onions fry until they start to brown (about 1 minute). Remove from oil with a fork, and place on a paper-towel lined plate. Salt immediately. Wash green beans, and trim ends off. 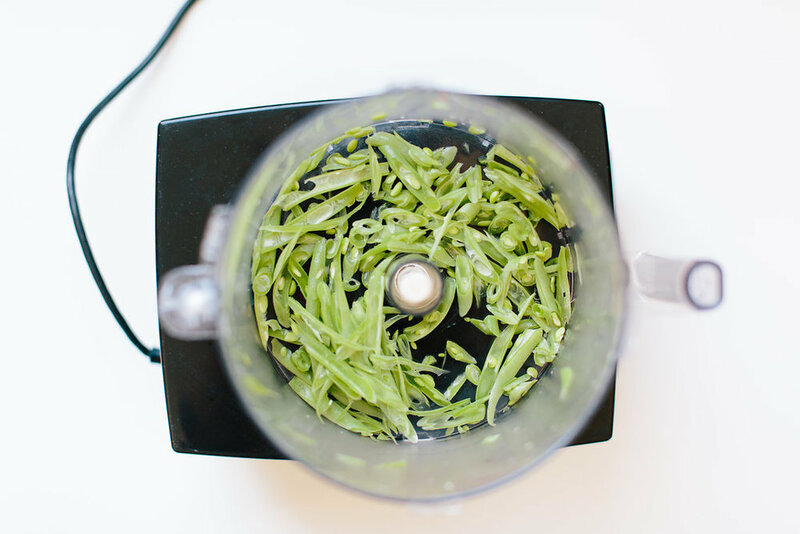 Using the slicing disc of a food processor, lay the green beans horizontally and press down with the cover to thinly slice. Warm the butter in a medium skillet over medium heat. Add green beans and cover. Cook for 8-10 minutes, checking periodically, until green beans are tender. Do not overcook! Season liberally with salt and pepper then transfer to a serving platter. Top with crispy onions and serve immediately. WHY? #1: the milk helps the flour stick to the onions. You can use cashew milk, or traditional buttermilk. WHY? #2: The smaller the pot, the less oil you’ll need to create a deep enough oil well to fry the onions in. WHY? #3: If you crowd the pot, the onions will stick together. Note: If you want to fry all the onion in fewer batches, you’ll need to use twice as much coconut oil so you can submerge more onions at once. Note: Be sure to shake off excess flour. If flour falls off the onion, it will likely burn in the oil. If the oil burns, you’ll need to toss it and start with fresh oil.